Umpire Roberto Ortiz makes his MLB debut during the Marlins-Nationals game on May 14 in Washington, DC, joining Larry Vanover's crew for two games of the MIA-WAS doubleheader, serving as the first base umpire alongside HP Umpire David Rackley, 2B Umpire Alfonso Marquez, and 3B Umpire Chris Guccione for Game 1, and as the third base umpire alongside HP Umpire Larry Vanover, 1B Umpire Marquez, and 2B Umpire Guccione for Game 2. Ortiz is on the International League roster for the 2016 season, which is his first season in the IL and third overall in Triple-A (2014-15 PCL). He has also worked the Gulf Coast, New York-Penn, South Atlantic, Florida State, Eastern, Arizona Instructional, and Arizona Fall Leagues, in addition to MLB Spring Training. He is the first Puerto Rican-born umpire to officiate at the Major League level since Delfin Colon, who was born in Santurce, Puerto Rico. Ortiz wears the uniform number 40 at the Major League level, which was last worn by Jeff Gosney, and makes his MLB debut at the age of 31. 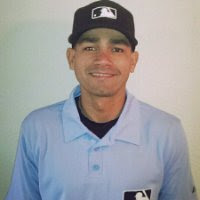 He resides in Orlando, Florida and is the third (and, presumably, final) new fill-in umpire to make his debut this season following Nic Lentz (April 20) and Ramon De Jesus (April 22).